I have a big, fat girl-crush on Melissa Clark, food writer and New York Times contributor. Not only is she beautiful, but her food is beautiful. Her writing is wonderful. And this is one of them. Don’t be fooled by the short list of ingredients; the sum of the parts is a fresh, spicy, unexpected flavor bomb ready in 20 minutes. As I am currently hoarding all of my chili powder for the Superbowl, I used red pepper flakes instead and found it different, but pretty good too. And don’t forget the lemon! 1. Preheat your oven to 425°. 2. In a large bowl, toss together the broccoli with the olive oil, cumin seeds, coriander seeds, and chili powder. Season with a generous sprinkle of salt and pepper. Spread the broccoli florets in a single layer on a baking sheet. Roast the broccoli for 10 minutes. 3. Combine the shrimp in a separate bowl with the lemon zest, the remaining tablespoon of olive oil, and a little salt and pepper. 4. After 10 minutes, remove the baking sheet from the oven. Scatter the shrimp over the broccoli. Toss everything together. Spread the shrimp and the broccoli out evenly over the sheet pan. Roast the shrimp and the broccoli together for about 10 minutes more. 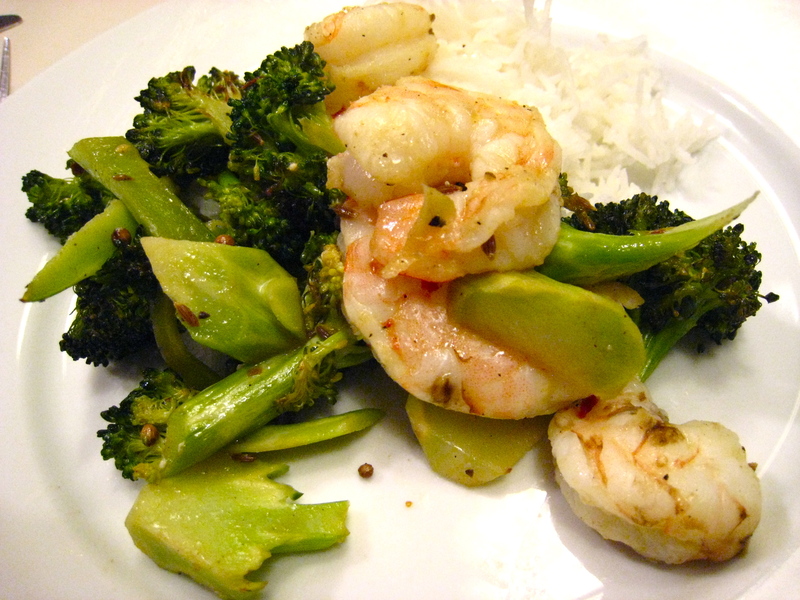 The shrimp should be just opaque, not overdone, and the broccoli should be nicely golden around the edges. 5. Serve with Basmati rice and lemon wedges on the side. Hey! I just stumbled upon your blog and the recipie above and it looks fantastic! Will def give it a go over the weekend! Happy Cooking! Thank you so much! Your blog looks great too. I look forward to seeing what you are up to in Mexico. And let me know how the cooking goes!